The kids head back to school this week, I think they're slowly getting excited to be going back and to see their friends. I've been busy this weekend trying to make sure we've got items for lunches and everything else in place. I quickly thew this menu plan together, I feel much better having a game plan. 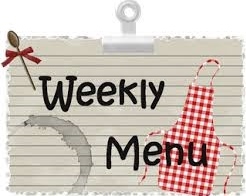 We'll be taking advantage of easy meals this week to help us ease back into the routine. It's also supposed to be hot and humid again, after enjoying a couple weeks with cooler temps, so we'll try to eliminate turning on the oven much. *Since the girls are heading back to school, I always send them with a cold lunch rather than them eating a school lunch. I generally try to choose a couple fun dishes for them to take each week and then they can either have leftovers or a sandwich/wrap the other days. This helps keep my grocery bill down a little bit too, and makes planning easy so I'm not trying to come up with a new idea for every single day.